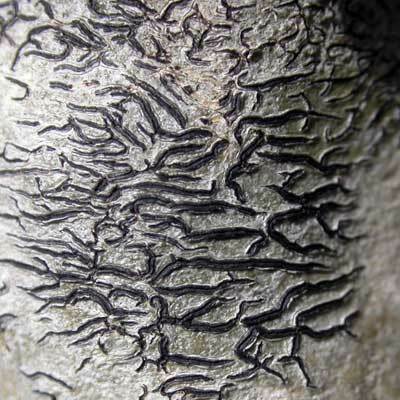 This bark epiphyte, with creamy white thallus resembles the ‘scripture lichens’ Graphis, but differs in the discs (lirellae) that are flattened and frosted instead of grooved and plain. From above, the configuration of discs can resemble a satellite image of the drainage pattern of a large river basin. 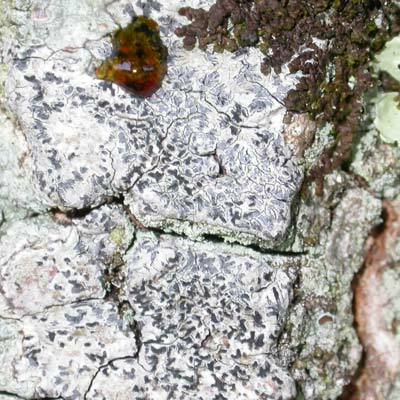 It occurs widely on smooth-barked trees and while indicative of more ancient woodland in Britain, it appears not so fussy in Ireland. A dab of Potassium hydroxide (K) will turn the thallus yellow. White frosting may obscure the colour of these discs. Simms, M. J., (2016). Phaeographis dendritica (Ach.) Müll.Arg. . [In] LichenIreland.